Wow… what a December, and what a way to wrap up 2018! 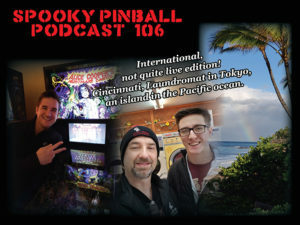 You’ll hear about our 1st ever trip to the 1st ever “Pincinnati” pinball show in Cincinnati, Ohio, where we got to hang out with friends, family, and fellow pinball geeks of all ages. You’ll even get to hear from Zach and Greg from Straight Down the Middle, and try to figure out which one of them is the nice one! That’s just a warm up, and Charlie, Bug, and KT also head to the land of all things giant kaiju monster goodness, TOKYO!!! Charlie and Bug decided to do a spur of the moment podcast in a laundromat in Japan, which HAS to be a first. From there, we take you to a surprise landing on an island for a truly wonderful work experience, then head home to recover. Terry at Pinball Life is giving away an AWESOME hand crafted Total Nuclear Annihilation Pingulp LE… yes, the LE MODEL! Top off this much goodness with Danni giving her strategy on Elvira and the Party Monsters, and of course our E.M. Dungeon master, and you’ve got a great way to start off 2019!